"One of the decade's most original and surreal psychological thrillers" - BestThrillers.com. A Fan of Death and Shakespeare promises to be the next extraordinary leap in the evolution of the female-driven psychological thriller. Fans of the genre have been forced to accept vague descriptions of psychological disorders afflicting various scheming murderers and serial killers. Readers left to form their own diagnosis assign labels like psychopath, sociopath, schizophrenic, bipolar, or psychotic based on their limited knowledge of psychiatry, a discipline with vast disagreement among its practitioners. A Fan of Death and Shakespeare features true identical-twin psychotics and describes their psychotic transformation. Psychotics are not born. They are transformed. The novel provides a precise and chilling description of Folie à Deux, the purist and most perfect form of psychosis ever studied. The reader is privileged to enter the minds of the killers to watch them become psychotic, struggle to live with their condition, and fight to cure themselves. Observe a world where only a privileged few have been able to function and from which none survive. The final element readers demand is a mind-blowing plot twist. 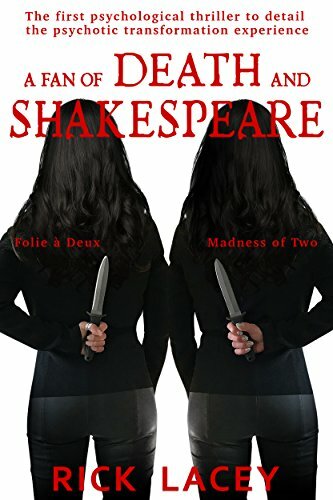 A Fan of Death and Shakespeare may be the only psychological thriller in which readers cheer for the success of the psychotic killers and the death of the innocent victims. Twin psychotic killers ingeniously hidden in the bodies of beautiful women is a weapon that ultimately proves impossible to stop. The plot is complex, but nothing is held back, and every aspect is well supported. Going into the climactic final scene readers will be emotionally attached to their own hopes, fears, and expectations. No matter how close they read and how certain they are as to just who deserves to live and who deserves to die, there is one thing this novel can promise; the outcome will shock every reader.